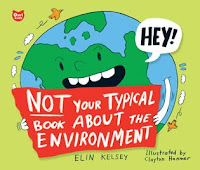 The author begins this book by saying, "Warning: This is not a typical book about the environment! It is not filled with doom-and-gloom messages about the state of the planet. It does not blame you, your baby sister, or your uncle Irving for climate change. It will not introduce huge, gnarly problems that are too big to deal with." This is pretty true. This book is crammed with ideas and facts about the environment from eco-fabric to healthy and environmentally safe eating habits. 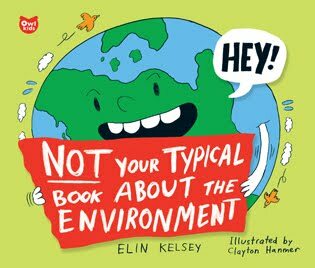 There are practical suggestions and stories about what real people are doing to help the environment - and what kids can do to help. The thing is....there's a bit too much information. Every one of the 64 pages is crammed tight with information, ideas, suggestions, facts, and stories. The type is small and dense, although the text is broken up into chunks with headers. While an older reader might not have a problem with the amount and size of the text, the illustrations are extremely cartoonish (and why do all the people have vampire teeth?) and the size of the book says "picture book". The book should either have been heavily edited and given larger, clearer type, or it should have been put into a typical middle grade book shape and given more mature pictures, or maybe photographs. This is just my opinion, of course. I borrowed this from my neighboring librarian and she really likes it - thought it was upbeat and attractive. A couple of the journal reviews do say the design is somewhat cluttered, but nobody but me seems to find the illustrations irritating. Oh well, that's how it is sometimes. Verdict: This book was a good idea and has a lot of excellent information, but the design makes it unattractive. I'll stick to buying recycled crafts books for the moment. I would recommend it for school libraries, especially if you're going to be doing projects or studies on the anything environment-related. ISBN:978-1897349847; Published March 2010 by Owlkids; Borrowed from the library. Sometimes I am beading. I pack all my bead boxes (b/c you never know what you're going to want to work on...) into a bag and pop over to Beadology in Lake Geneva, where the kindly proprietor allows me and my library friend Sara to bead in the back room. This is very handy because she has all the tools anyone could possibly need, she's right there and handy to answer questions, and if one feels a sudden need for a bead, it's right there. 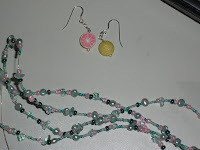 So today I finished stringing all the beads for a necklace - I was about half done before today. It's going to be a crocheted wire necklace with several strands and I fondly think of it as my mermaid necklace. The earrings are of my selection, but not my production. 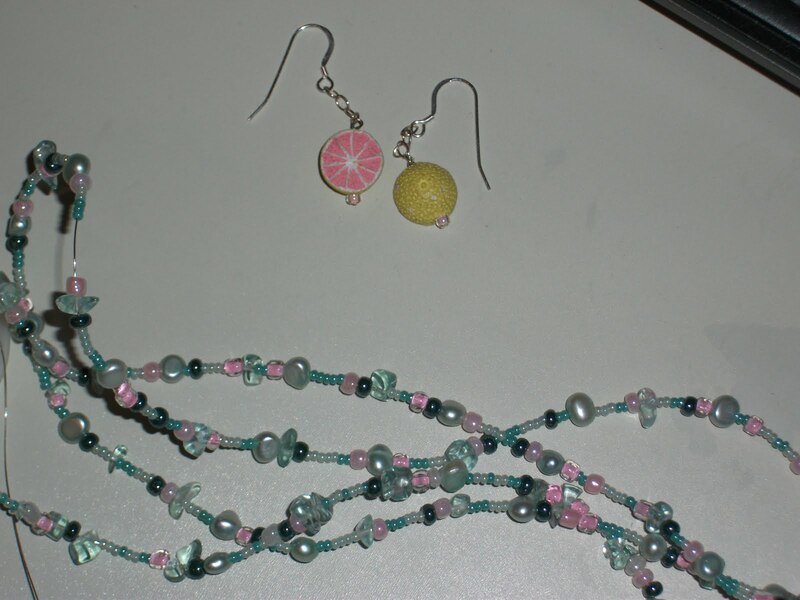 I haven't felt the urge to create earrings, so I just pick out the stuff and hand it over and the nice lady pops it together for me. Er...no, I don't actually wear much jewelry. But they look very pretty hanging on my wall. So. Monday. For Make it and Take it we made sand art. I bought a set of little bottles from School Discount Supply and LOTS of colored sand. I was worried this might turn into something that should have been planned for Messy Art Club, but it worked really well. I poured a little sand into cups and the kids used the cups and small plastic funnels that came with the bottles to put the sand in. The funnels did have to be snipped at the end for anything to get through! Our new vacuum cleaner did a great job of sucking up the inevitable sprinkles that landed on the floor. The only drawback to this craft is it goes pretty fast - the bottles are tiny - and most of the kids don't care about fancy labels, they like to pour the sand in and shake it! So be sure to have lots of extra bottles if you do this. Wii Gaming on Tuesdays is and isn't successful depending on how you look at it. Yes, there are kids in there playing - but with only 4 controllers, and many games only taking 2 people, it's a limited program. Lots of kids like to sit and watch, but we still have vast numbers of kids wandering around the library. How do you accommodate so many kids with one gaming system? We're back up to our very healthy numbers for Lego Building Club - we hit the 50 mark again this week. We've been doing this since last fall and I'm ready to tweak it a little. First, I'm going to pull out all the people and ration them. The first 5 or so kids that come in grab all the people and then there's arguments and fusses. Plus, it means the kids aren't actually building anything - they're competing for "special" pieces and then basically arranging tableaus with the Lego people. I'm planning to laminate the collection of building instructions I have and see if that sparks more interest in actually building. That afternoon, I opened up the Storyroom again for the middle schoolers, something we're going to try to do every week. This week we put on a movie, Toy Story 3, but although that was their pick, only a couple of them came in. Groan. We are starting our new (or rather, rewritten) policies on Monday and are going to hand out bookmarks to all the kids alerting them to the stricter rules and consequences, so we'll see how that works. I went to our system's YS summer pre-conference on Friday. Got lost, of course, but for once it wasn't my fault but a combination of bad directions from google maps and unclear directions when we called the hotel. Marge Loch-Wouters did a program on storytelling which was lots of fun, although not really practical for me (I'll explain why in a minute) and Leslie Peterson did a program on creative programming, which I really enjoyed and got some good ideas for my art programs. Although she's probably going to regret giving us her email....I still have lots of questions! So, my thing about storytelling. First of all, I like storytelling. I'm pretty good at it. I've done it on and off in storytimes, with friends, and in classes quite a bit. However, whenever I've done storytelling workshops, I notice the "troubleshooting" bits are generally directed towards dealing with large groups, unruly children, losing your audience, etc. My problem is just the opposite - I consider 10 kids at storytime a crowd. 3-5 is an "average" group (This is a whole other major issue, which I'm planning to deal with. Later.) Anyways. I spend a lot of time in storytime trying to MAKE kids wiggle, participate, laugh, or do anything but sit solemnly on the carpet and stare at me. It is really, really, really hard to tell stories with an very small, very shy audience. Second issue, I've noticed a lot of storytelling (at least that I've looked at or experienced) is really aimed towards various elementary ages, especially 1st & 2nd grade. I simply have no venue for storytelling with this age group. I only do school visits a few times a year, and then I have an average of 15 minutes with an entire class group (i.e. ALL the fifth graders in the whole school) to talk up the summer reading program, summer programs, and new books and services. I get occasional school visits to the library, but that's for a tour, getting library cards, checking out books, and maybe a quick project or something. As I'm trying to balance my easy reader section between classic easy reader fiction, easy reader nonfiction, and some of the new and fun genres that are now being produced, I suddenly realized that I'd forgotten I also needed to balance reading level. Argh! There's always something else to think of. I think my collection skews a little too heavily on the upper levels, so I'm looking at some very beginning easy readers. Sarah Week's very funny Pip Squeak stories are just perfect for this age range. 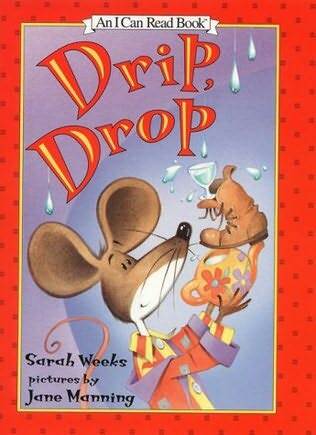 In Drip, Drop, Pip Squeak the mouse is trying to sleep when a leak appears in his ceiling. Every time he puts out a receptacle to stop the leak, another one appears! Finally, he finds the solution. The story is silly but delightful with a simple rhyme scheme kids will be able to hold onto as they work through their first sentences. The illustrations complement the text, but don't supply so much information that readers will be able to neglect the text and get the story from the pictures. 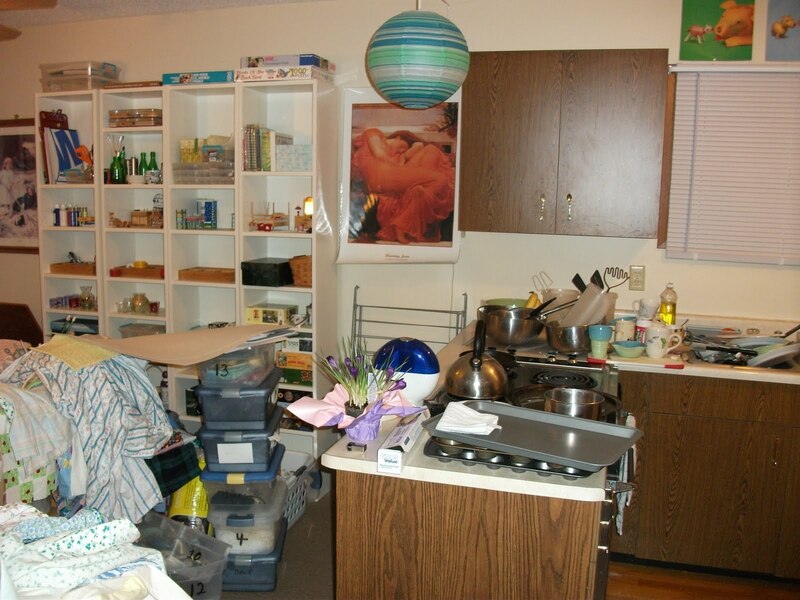 In Pip Squeak's next adventure, titled after himself, Sarah Weeks' rhymes feel almost Seussish as Pip vigorously cleans his house, then watches in despair as his friend Max trashes it. 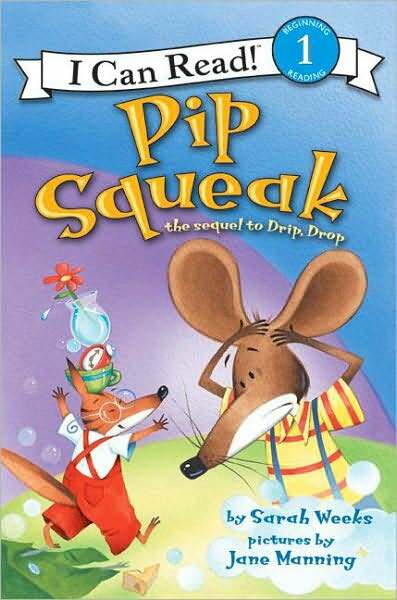 Max offers to help clean up - and tries his best, but Pip squeak has a better solution. The rhymes in this second volume feel faster and more bouncy, fitting perfectly the frenetic pace of the simple plot. The illustrations are a little more silly, often seen from a tilted perspective, especially when we meet Max. Verdict: Recommended if you are looking to fill in your younger reading levels in easy readers. An excellent pair of books to pair with Dr. Seuss. ISBN: 978-0064435970; January 2002 by HarperCollins; Borrowed from the library. ISBN: 978-0060756383; May 2008 by HarperCollins; Borrowed from the library. Another quick foray into the adult world...I'd forgotten how much fun the paranormal mystery could be. This was a quick read, but a mostly satisfying one. I liked the interplay of the different characters and the way the world kept shifting to show the darker aspects underneath. I didn't care for the heroine's abrupt shift to trusting the vampires. Um, hello! Yes, they saved your life - but they're perfectly willing to kill you at any minute as well. Little mind control going on here? But other than that one quibble, which is kind of required in a vampire story, it was perfect and I'm looking forward to the sequel. Avery wants to be a cowboy, but he just doesn't fit in at Cowboy Camp. His clothes are all wrong and he can't do any cowboy things the way they're supposed to be done; he's allergic to horses, can't stand beans and grits, and rope gives him burns. But one night a low-down, ornery bad cowboy sneaks up on camp....and Avery has to decide if he does have what it takes to be a cowboy! I liked the tongue-in-cheek silliness, especially at the end when Avery's disadvantages were turned into a way to scare off the bad guy. I did feel like we were just dumped into the story. Does he really want to be a cowboy? Where did they all come from? 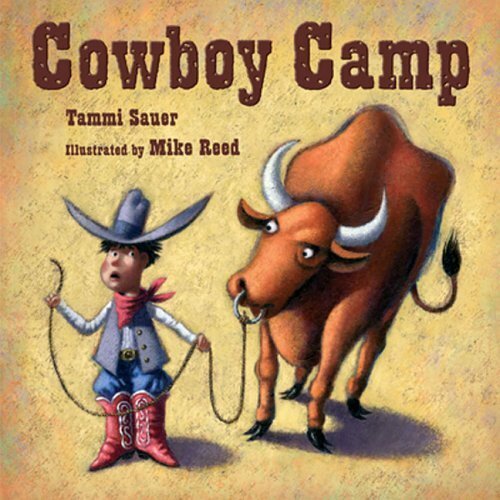 The story seems to have both modern elements - the cowboys in training include girls and different ethnicities, as well as the whole idea of Cowboy Camp, but the bad guy seemed right out of a Wild West story. I didn't have any strong feelings either way about the illustrations. They have a strong Western flavor with a sort of dusty patina over everything (you think history, I think dirt) and there are some nice backgrounds for the various characters and action. Verdict: Are any kids into being cowboys today? If so, they'd probably appreciate this book. It might be nice for kids who feel like they can't do anything right also. I'll have to try it out on some kids before I get a definite feeling for it. ISBN:978-1402722240; Published November 2005 by Sterling; Borrowed from the library. How do you find time to read so much?! Answer: I don't do anything else. 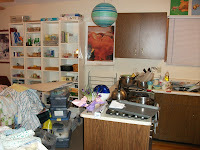 As you can clearly see from the state of my kitchen (yep, that's pretty much every dish I own. I haven't done dishes since I got back from San Diego, other than washing the occasional fork) and my craft area - there's a giant pile of fabric you can't quite see behind the stack of plastic tubs. It has been there for many months. I will get it sorted, cut, ironed, and organized in the fabric closet. Eventually. 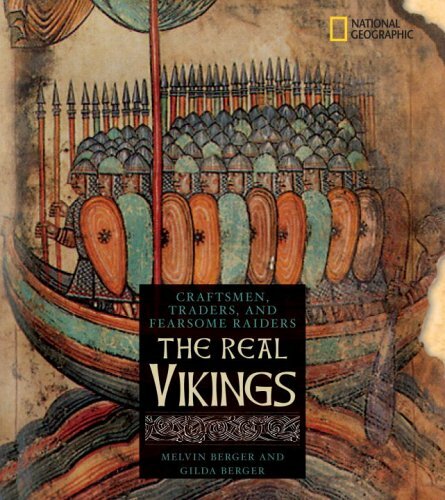 Melvin and Gilda Berger present a simple, but detailed introduction to the Vikings in this National Geographic history. The text is illustrated with maps, photos of archaeological artifacts and contemporary images, and decorated with a layout taken from 17th century Icelandic manuscripts. Each chapter deals with a different area of Viking and Scandinavian life, beginning with a general introduction and followed by a description of Scandinavian life at home. 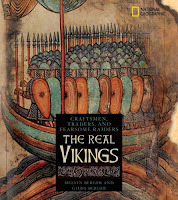 Further sections are devoted to Viking power structures and religion, and to the various factors that made Vikings such feared and powerful invaders. Accounts of the history of Viking raids are followed by a description of settlements in Iceland, Greenland, and northern America. The final chapter discusses the many contributions Vikings made to historical and modern society, including language, political advancements, and cultural ideas. A timeline, index, and further resources are included. Discussions of archaeological discoveries are spread throughout the chapters, showing the sources for the historical information presented. This isn't a long book - only 55 pages, but it packs an extensive amount of information and history into a compact space. If you need more Viking or early explorer nonfiction in your collection, this is an excellent choice. Verdict: An excellent choice, but I don't need any more history right now. A quick step away from children's books for an adult mystery....the author promised me, when she signed a book at ALA that I would like it - and she was right! Darby Farr returns to the Maine coast and island she grew up on to fulfill her estranged aunt's dying request. But as soon as she arrives she's suddenly involved in murders, mysterious circumstances, threats, and old secrets of her family and friends. There's a little hint at romance and some humor and interesting tidbits about real estate, but no info dumps. I thoroughly enjoyed this mystery and look forward to reading the sequel! If, like me, you like good mysteries with definite plots, twists and turns, and a complete dearth of male detectives suffering mid-life crises, angst-ridden reflections on the pointlessness of life and justice, and nasty characters, then you'll be pleased to pick up this brisk, exciting, and thoroughly satisfactory mystery. For Make it and Take it on Monday we made pom poms, using the instructions in the Kids Can Press Jumbo Book of Crafts. Nobody does craft books like Kids Can, and this is one of my favorites. The pom poms were really easy to make and the kids figured them out right away, even the littles who came in to join us. You can see pictures here. We had Wii on Tuesday, but there just aren't enough controllers for everyone - or that many interested kids, so in the interests of peace, while we're still formulating our policy, I opened the storyroom and told the kids they could make me some giant snowflakes to hang from the ceiling. This worked on the one hand - the kids were really excited, several of them made some gorgeous snowflakes, a couple boys played a lengthy and fairly calm monopoly game, but I had to kick out some kids for general disturbance bordering on fighting, a bunch of smaller kids came in and wanted help with the crafts and I had to explain several times it wasn't a program, and I forgot to tell anyone to clean up, so there was a mess. This needs more organization! For Messy Art Club on Wednesday, we made fingerprint art, a la Ed Emberley. Pictures here. As you can see, we had a big mix of older and younger kids. I had about 10 stamp pads, but there weren't really enough - although the kids were very good about wiping their fingers before changing colors! I would do this program again, but probably as a Make it and Take it, which generally has a smaller crowd. Our theme for preschool storytime on Thursday was meant to be ducks, but I realized partway through it was really eggs! We started with Barney Saltzberg's Good Egg, which I have in my professional collection. I asked all the kids (all 6 of them - we have very intimate preschool storytimes) what comes out of eggs. "Chicks!" "Ducks!" "Dinosaurs!" that last was completely unexpected, but hilarious. Mostly for the dinosaur kid, we read Emily Gravett's Odd Egg next and they EXPLODED with laughter at the surprise finish. Then we read Jackie Urbanovic's Duck Soup and Catherine Friend's Perfect Nest. I switched to Jim Gill's The Tempo Marches On for an opening song b/c I was too tired to do all the jumping and I got everyone's names right in our name song, except the twins and they're impossible to tell apart. We used my new duck die cuts to make "dancing ducks" by decorating them and taping them to ribbon which we tied to popsicle sticks. I opened the storyroom again Thursday afternoon for the middle schoolers, but it worked better this time. I gave them yarn and a quick tutorial on making pom poms, reminded them to clean up (which they did) and they were fine. It was a slightly different (and smaller) group of kids which probably helped. Happily, my incipient cold/sinus infection (which I am sure I caught from my mom over the phone last weekend) disappeared. Unfortunately, I seem to have passed it on to at least two of my colleagues and possibly more. We also had our book sale/bake sale this weekend and I made lemon cupcakes. They looked nice but I personally thought they tasted rather vile. Oh well. It was an experiment. Ta-da! I'm always excited to find a good nonfiction read-aloud, and I'm pleased to announce that this is definitely a good one! Steve Voake (author of the sweet Daisy Dawson beginning chapter book series, which we are quite fond of in my library) explores the world of insects, giving clues and hints about where you can find common insects, how to identify them, and a little bit about their habits and habitats. The book looks at wasps, ants, solitary bees, dragonflies, and much, much more. The book isn't meant to be an in-depth guide, just a light introduction to the world of insects and some of the fascinating creatures you can find outside. There are more details about the various insects in smaller text, a section in the back on how to track down more insects, and a little index. My only doubt on this book is that, while I'm personally fond of Charlotte Voake's illustrations, which have a lovely old-fashioned, summery feeling, they can be hard to use in story time since the colors are very faint and the illustrations are sketchy, if you know what I mean. Verdict: A great book for insect story times, perfect for preschool through 1st or even 2nd grade. Probably work best with a small group that can sit close enough to see details in the illustrations. ISBN: 978-0763644475; Published February 2010 by Candlewick; Borrowed from the library. I'd heard interesting things about this story and picked it up at ALA to take a quick look. I'm not much of a YA reader, but I can see that this has a lot of elements that will appeal to young adults - and to adults. The main character, Asha, goes through a lot of growth has her idea to sell t-shirts, mainly to support a senior trip to somewhere exciting, turns into a "movement". She deals with changing friendships, college application and acceptance pressure, and getting more involved in the philosophical (not exactly the word I want but it will have to do) ideas that start growing behind her original make-a-few-bucks-and-protest-something-annoying plan. This book didn't really work for me - which is nothing to do with the writing, characters, etc. and everything to do with my own likes and dislikes. I happen to dislike teen fiction that's school-centric and especially books with a "my senior year changed my life" theme. Not that they're unrealistic. I just don't like them. So, interesting book, strong characters, will appeal to a wide range of teens and young adults, I'm happy to add it to my library, but it's just not for me. Review copy provided by Flux at ALA Midwinter. 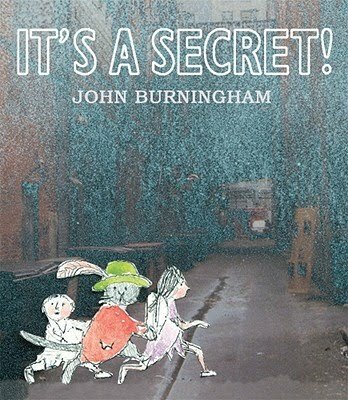 While there are some Burningham works I find fascinating and well-deserving of his high reputation, many of them just don't speak to me. Marie Elaine wants to know where her cat, Malcolm, goes at night. She finds him all dressed up one evening and accompanies him - and a few other stragglers - into the night. After a few mild adventures with dogs, they finish up on the rooftops. There they meet many other cats and finally the Queen of the Cats. They slip back home and Marie Elaine is tired but happy, now that she knows where cats go at night - but she can't tell anyone, because it's a secret. The story just fell flat for me. There's no strong thread of action or character to hold it together. 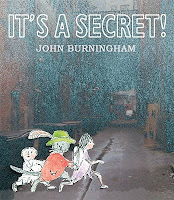 While I like some of Burningham's illustrations, these felt repetitive and scrawly. The view of the city rooftops as they climb a crane is eye-catching, but the other illustrations swing wildly from watery and colorless sketches to painfully brilliant splotches of color against dark and grim backgrounds. Verdict: This one really didn't work for me and I have trouble seeing it appealing to children because of the slow plot and flat storytelling. ISBN:978-0763642754; Published June 2009 by Candlewick; Borrowed from the library. 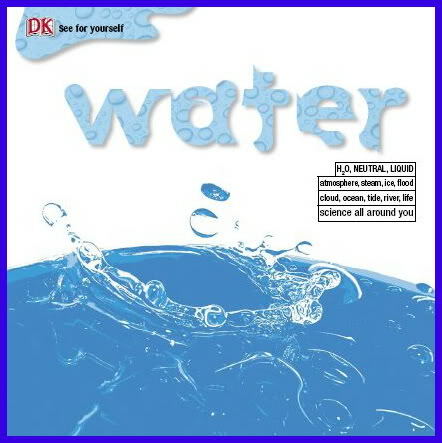 In typical DK fashion, this book is full of dazzling photographs, facts, information snippets, and a wide range of information related to water. It includes information on the chemical properties of water, salt vs. freshwater, and the various life forms, including humans, who live in, around, and on water. There are graphs and statistics, and one giant gatefold depicting a complex water cycle. Information on pollution, drought, water treatment, and more are also included. There is a timeline, glossary, and index. A fascinating book for fact-lovers and those interested in the natural world and chemistry. Verdict: Interesting and facty, but I have no need for a facty book on water. I kind of wonder who does? Its facts are too diverse for a report or school project, although it might get you started if you're looking for a subject. This was the first time I was able to attend the award ceremony - I couldn't make it in early enough for the one last year. So, I got up at 6:30, vainly tried to rouse my slugabed sister (who had stolen all the covers AGAIN - I'm going to think twice before we share the bed next time (-:) and off I went. Alex awards - not my area. My teen area skews kind of young anyways. I will pass this list onto our director, who buys the adult fiction. Coretta Scott King - not a favorite award of mine, as I've had dismal circulation results for almost everything I've bought with this particular sticker. Just to make life more interesting, I might mention that I'm on the controversial "awards should be the book and not the person" side of the CSK argument, which I've seen discussed on a couple blogs. Plus, they always seem to award to a small group of people over and over again. Pura Belpre awards - about which I kinda feel the same as the CSK, except I have an additional complaint and that is that I have yet to see one of these books embody the Latino cultural experience of the kids in my town, which involves a lot less culture and a lot more everyday experience with school, family, and friends than these titles generally do. However. Odyssey - I don't usually pay much attention to this because of the very small number of audio books I buy each year - usually I buy stuff that's very, very popular, or specifically asked for. I will buy The True Meaning of Smekday because I want to have a book club on that and several kids prefer audio. Stonewall awards - Is that new? I don't remember seeing it before? Or was I not paying attention? We own will grayson, will grayson and I plan to buy Love Drugged, mostly because Kelly of Stacked sold me on it, but I don't think we need the other titles. I was thinking of buying I'll get there it better be worth the trip which has been reprinted - anybody have thoughts on that one? or should I buy Almost Perfect instead? I think I'll do it that way. Yalsa nonfiction award - the whole thing is too long to write. Um...no. Can't see any of my teens being interested in Janis Joplin. I might want to read it though. Geisel - I really like Bink & Gollie, but imo the vocabulary is too complex for an easy reader - or a beginning chapter book. And it's the wrong format for a BEG too. We put it in picture books, but I noticed older kids pulling it off the new shelf, so maybe we'll shift it over to easy reader. I dunno, where did you put it? Loved Ling & Ting, reviewed it a few months ago, and while my personal Elephant and Piggie favorite this year was Can I play too? I can see why the committee chose We are in a book. Printz - Another award I will purchase selectively. Especially since my ya budget is so delicate this year. Ship Breaker - I'll get it because it won. I think it's a little too lengthy for most of my dystopian fans, but you never know. Newbery - ah, another collection of historical fiction about girls and their relationships with their mothers. Unless someone asks for it, I'm not going to buy Turtle in Paradise, Holm's other historical fiction novels don't check out much and my juvenile fiction budget is even touchier than my ya. I will buy Heart of a Samurai as that's something a bit different and some kids will like it. Dark Emperor is out, because I'm not buying poetry for, oh say another 5 years, except replacements for Shel Silverstein. As mentioned above, I already bought One Crazy Summer *mutter mutter* and I guess I have to buy Moon over Manifest, despite my dislike of quirky southern novels. Caldecott - Bill Thomson was robbed! Robbed, I tell you!! NOTHING FOR CHALK???? I am very, very miffed. My only consolation is that 30, 40, and 50 years from now when some authors and titles who I shall not name are gathering dust because "we can't weed them they won an award", librarians across the kidlitosphere will be receiving stumpers for "that book with the dinosaur and the butterflies who came to life and it was my favorite book when I was a kid and I want to read it to my kids" So There. Anyways. I like Amos McGee ok, it does have a certain charm that grows on you. I meant to buy it, but hadn't gotten to it yet. We already have Interrupting Chicken, which I reviewed for Cybils. See comments above on Dave the Potter. Batchelder - meh. don't really care. and the Weston Woods video...oh, sorry, the Andrew Carnegie Medal...nah. I'm not paying $60 for a 10 minute video segment. Seriously, not happening. William C. Morris - I think I will buy The Freak Observer. I think the cover's kind of gross, but I bet teens will check it out. Schneider - Pirate of Kindergarten looks cute, we'll get that. Already have After Ever After and I've been meaning to get Five Flavors of Dumb. I am blogging this, or most of it, in bed, late Friday night. I don't usually blog in bed, but I can't sleep until I get all this out of my head so...this is going to be a long post. More on ALA Midwinter; or, What are you going to do with all those books? A fine time was had by all, many exhibits were visited, many ARCs were obtained. I won't list everything and most of my stuff hasn't gotten back yet - you've heard about the highlights. For those inquiring minds, wanting to know exactly what I am going to do with 80lbs of books....a few special books were picked up specifically for various librarian friends and bloggers. A few very special books will stay on my personal shelves until I get around to buying a real one. Young adult books I skim to see if we'll be buying them or not, then they will either be summer reading books (every kid who signs up for summer reading, age 0 to 18, receives a free book) or incorporated into teen drawing prizes. Middle grade I will read and blog, then the same fate awaits, except for a couple things I somehow ended up with multiples of so I might do a little giveaway. F&Gs (folded and gathered I think that means, it's picture book galleys) I will read and show to various other librarians, then if I personally like the art they'll be cut up and added to my picture book art collages that cover my walls. If it's not something I want to stare at all the time, they'll go into collage bins for craft projects at the library. I'll do another post on the award winners, maybe. Does anybody really need to hear another "take" on these titles? I have to go over them anyways to decide what we're buying and what we're not touching with a ten foot pole. I went to the "Neil Gaiman discourses and Nancy Pearl tries to get a word in edgewise program" (it's not that I don't like Neil Gaiman, despite the whole Sandman trauma thing, I just dislike the whole concept of celebrities, even authors. I feel uncomfortable sitting amongst a predominantly female group of professionals swooning over a guy who looks like he hasn't slept in the last three years. it's embarrassing. I think even he is a little embarrassed. Or I hope so.) I went to several publisher previews and I agree with one of the editors, I think it was at HarperCollins, who said they weren't good at booktalking. Uh uh. Maybe they should give advance advance copies to librarians and have them booktalk their titles? Or something? I like previews though, even if they are a little dry. I was very excited to learn that Houghton Mifflin is putting together a website for Scientists in the Field. Yay! A complete list finally! I probably had other things, but I haven't had time to go through my notebook and decipher my scribbles. "you're a librarian? is that really a career anymore?" Being a public servant, and the point of the exchange being to calm her down (in my mind at least) and being kind of bored at the moment, I decided to give her my patent pending 15 minute lecture on the services, products, and uses of the modern library, specifically the library at which I work, the programs and services we provide, function of each staff member, and how the community uses us, finishing up with circulation and program statistics for the past year and a quick overview of the library job market in various field. "oh. I've always really liked libraries, I used to go to ours all the time." So, we've been having increasing problems with our middle school kids after school. We have a group of 10 to 30 middle school kids who come to the library every day after school. They are not "bad", but they are noisy, disruptive, constantly moving around the library and between levels, racing up and down the ramp to the upper level, hanging out in giant groups at the stairs, blocking entrances, playing hide and seek and tag in the stacks, and, ok, they are kind of sassy. We have a teen area and 2 study rooms upstairs, 1 large study room, a children's area, and a children's program room downstairs. We have available board games, scratch paper and crayons, magnetic poetry, books, comics, magazines, and three after school programs a week. We have scheduled a second desk person upstairs (our main information desk is downstairs) on Mondays, Tuesdays, and Wednesdays. We have tried kicking the kids out of the library - and routinely kick out 5 or more every week, but they're back again and just as bad the next day. I've had them do volunteer tasks, but as soon as they're done....well, they're back at it again, and I have a finite number of tasks. This is the second year Pattie Woods, our local Parent Educator, and I have been doing a party for each age group up to five. We had about 20 people today, and offered community information, the birthday bags provided by Parent Connections, crafts, cookies, and games, all with a circus theme. I'm a little disappointed with the low turn-out we've been getting for these programs. Partly the weather, partly insufficient publicity I think. But the age designation may be limiting it as well. We discussed turning them into a monthly "meet and greet" session, giving parents and kids of all ages an opportunity to meet Miss Pattie and the youth services librarian (that would be me) and sample lots of different kinds of programs for different ages, kind of see what we do at the library. Maybe invite some of the school librarians to stop by? We'll think about it for next year. I'm always on the lookout for new and different easy readers, but occasionally it's nice to fall back on the classic animal friends model. Porky is messy and artistic. He likes to bake and write poetry. He doesn't like children - especially kittens - very much. Bess is perfect. Perfectly tidy, a perfect skater, and perfectly organized. She loves her three kittens, Two, Three, and Bunky. Despite their differences, Porky and Bess are friends. Porky appreciates Bess' perfect skating and her sympathy when he struggles with a poem. 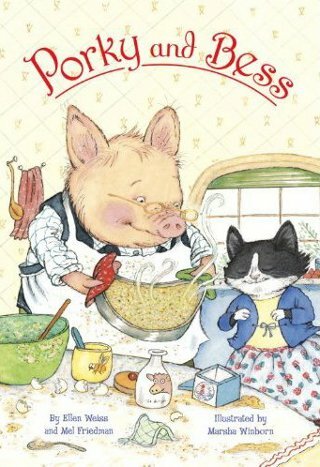 Bess helps Porky with his baking and listens to his poetry. They are very different, but they are still good friends. There are a lot of classic easy reader plots in this story - adult animals living (mostly) on their own, friendship despite differences, and the four sections of the story which each contain a different plot. Like most of these easy readers, one member of the pair is more adult and responsible, while the other has a more childlike character. I'll let you read it to find out which is which! However, there are several interesting oddities, including Porky's moon cake and Bess' kittens, and some sly humor for adults, such as the title. The illustrations are warm and colorful and the text blends in smoothly with the art. Verdict: Recommended if you need additional classic fiction easy readers. But I strongly suggest you take a look at your easy reader section, if you haven't in a while, and see how balanced it is. I'm currently trying to balance nonfiction easy readers, classics, and some of the new and exciting genres that are coming out now. ISBN: 978-0375854583; Published February 2010 by Random; Purchased for the library. Where to begin? Well....books are always a great place! Lots of my books are on their way - I mailed about 80 lbs! But I brought the SPECIAL ones back with me in my suitcase. So, here is the first list of ARC loot! By the way, you'll notice I've read quite a few of these already....see, unless you're into night life (which I'm not, but I can attest that San Diego does, in fact, have a vibrant night life, since 90% of it passed under our hotel window every night) there's not much to do in the evenings after a conference except read the books you got that day. It's kind of nice. No distractions, just great gulps of reading. Anyways, I brought back a bunch of F&Gs, and some other stuff, but this is mainly what was in my suitcase. I resisted reading Savvy at first, because I have a strong dislike of what I think of as "Southern quirky" but once I started I was drawn into the story and enjoyed it very much, although it was still a bit too quirky for my taste. 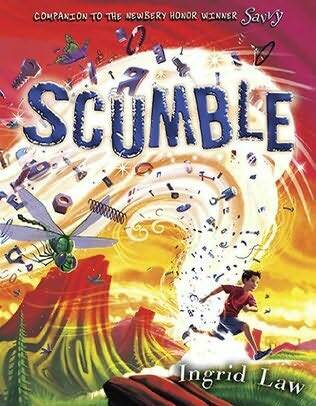 I was prepared to like Scumble and I was not disappointed. Nine years after the events of Savvy, Ledger Kale is waiting for his own savvy to come through. He's absolutely, desperately sure it's going to be speed. After all, that's what his savvy-less dad wants most of all, so it's what he wants too. Unfortunately, that's not what he gets. What Ledger gets isn't just a savvy; it's a whole lot of trouble. Suddenly, instead of being on his way to star of the track team at school and a hero to his dad, he's stuck at the family ranch in the middle of nowhere, wondering if he'll end up like his Rocket, stuck there forever because he can't control his dangerous power. Into this volatile mix of family pressure and magical talents, pops one SJ. She's determined, she's nosy, and she's going to find out what's going on at the ranch whether Ledger wants her to or not. Will the family secrets be revealed to the world? This story is all about changes. Ledger is experiencing both the normal changes kids go through as they grow up; worrying about how he measures up to his parents' expectations, wanting to be independent, and realizing his parents aren't perfect. He's also dealing with a powerful talent and learning that it's important to have control and to know when to let go. I was drawn in by the characters and rapid pacing of the plot immediately. Although there are several different storylines, they are smoothly woven together throughout the story, and there's no chance for the reader to lose interest as the characters change and grow. I did feel Ledger's discovery of the other side of his savvy was a bit too opportune to be realistic, but it did move the plot to a conclusive ending. I have one other complaint about this book, and it's kind of a general one about middle grade literature. Why is this story so darn long? My galley clocks in at a massive 401 pages. It's marketed for grades 3 - 7, but only a few truly voracious readers in grades 3 - 5 will pick up a book this large. Middle schoolers are likely to take one look at the cover and dismiss at as "too young". I'm seeing more and more of these thick books for the upper elementary grades, and they're just a bad idea. Yeah, I hate series, but please, please, please publishers break these things up! Every time I add one of these doorstopper books to my library, no matter how fascinating, exciting, delightful, or well-written the story, I feel sad, knowing that 90% of my young patrons will take one look at the massive spine and hie themselves back over to the series shelf, where the books are skinny and appear more manageable. Verdict: Recommended for kids who like realistic stories as well as fantasy. You'll need to do some solid booktalking to get over the length; I recommend something along the lines of "This book obeys the most important rule of middle grade fiction: Always include an explosion. The massive bugs are just an extra." ISBN: 978-0-8037-3307-7; Published August 2010 by Dial; ARC provided by publisher through LibraryThing Early Reviewers. And that's the YA plan. Of course, December 2010 Voya just arrived on my desk so.....Comments? Horror at me leaving out your favorite title? Complaints? Argument? Suggestions welcome. Next we have the chick lit, for lack of a better word. Or, as I usually call them, Sarah Dessen read-alikes. The sequels aren't quite as egregious here, but they are peppering the shelves. I can't take it any more! I'm tired of getting bugged for the Pretty Little Liars series. I will buy #7 & 8, although I'm sure they'll be as ignored as Gossip Girl, It Girl, A-List, and all those other mean girls series in another year or two. I'm not buying the whole dang series though. Grr. Now all that's left is the "everything else" list. Later! Although I am writing this post on Wednesday the 5th, I am, at this moment, probably on my way to the San Diego Zoo!! Alfie is upset. His mom makes him take baths, set the table, clean his room...he doesn't like to do any of those things! But when she tries to take away his red shoes, claiming they're too small, it's the final straw and he decides he must run away. So he takes his favorite red shoes, his blanket and his pillow and gets ready to leave. Has he got everything? 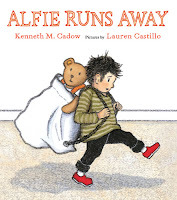 Fortunately, his mother has some good suggestions about things he will need - his teddy bear, some books, a water bottle...Alfie finally sets off, but discovers running away is a bit harden than he expected and maybe he can find a solution to the shoe problem. Cadow's simple but lightly humorous story will resonate with frustrated children everywhere, especially those who hate to give up beloved possessions for any reason. Parents will enjoy the gentle humor of the story and both can giggle together about Alfie's predicament while applauding his solution. Castillo's scratchy art is comfortable and full of life, movement and color. Verdict: Recommended. I think there's another picture book out there about running away and finding all your things too heavy to carry, and several just on running away but this is a nice contemporary look at a topic that hasn't been addressed for a while. ISBN: 978-0374302023; Published April 2010 by Farrar Straus & Giroux; Borrowed from the library. This week at the library; or, We started back too soon! My Reading in the Middle book club on Tuesday night was a flop - nobody came. Too soon after school started, plus it was a very cold night! However, it's not a time-intensive or expensive program, so we'll just try again next month. After Tuesday night, I was worried that the strong numbers for my after school programs over the fall were a fluke...but 25 people, kids and parents, showed up at my new Messy Art Club! We used Godeleine de Rosamel's book, Drawing with your hands. It shows different ways to position your hands for tracing so you come out with different animals! We traced lots of fun shapes and then painted them. Minimal mess, maximum fun! As always, I like to start the year with butterflies! It's cold and snowy outside, and glittery inside! We're still starting story time with Jim Gill's Jumping and Counting (which reminds me I need to exercise more if I'm going to be able to jump up and down for 10 minutes since we play it several times) Then we sing "The more we get together" using all the kids names, which is for me to learn names! We didn't do any other singing or action rhymes today, just some of our favorite butterfly and caterpillar stories - Houdini the amazing caterpillar by Janet Pedersen is a favorite, especially when the kids get to tell me what he's doing in his tricks! Lois Ehlert's Waiting for wings is, of course, a classic. I belatedly discovered that our copy was horrendously torn, another book for the replacement list! We finished off with The Very Hungry Caterpillar by Eric Carle and the kids were all very pleased to see a book they recognized and help me read it! We made butterfly masks and are looking forward to next week! Tim is starting over after his mother's death, moving to live with his dad in a small fishing village on the New England coast. 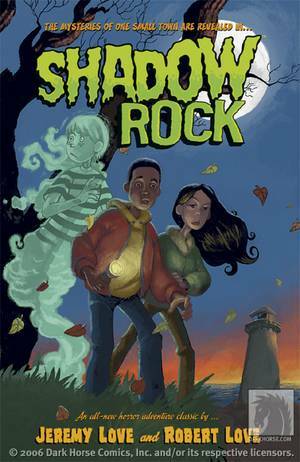 But there's a dark mystery in Shadow Rock and Tim has bigger problems than the bullies who are making his life miserable. With the help of Emily Proctor, daughter of the most powerful family on the island, and the ghostly Kendahl, Tim tries to solve the mystery before another tragedy occurs. There were some things I really liked about this story. It was nice to see some minorities as main characters, instead of sidekicks. Tim's strained relationship with his dad is painfully realistic fits well into the story. The text was ok, a little spidery, but readable and I mostly liked the art. But the story felt very loose and incomplete to me. The collection of villainous adults always felt like cartoon villains, never projecting the real sense of menace the authors seemed to be trying for. While the bullies' treatment of Tim was realistic, and his momentary new friend's behavior believable, the bullies' ridiculous clothes made them unbelievable as "the cool kids". The time period of the whole story was confusing. If I could have suspended disbelief and looked at the story as a "town cut off from time" genre-ish thing, it might have worked, but the characters were too vague. Verdict: Not quite what I was hoping for, but I'll look for others by this author. I take it back. You CAN always have one more bedtime story. It's a genre that is never too full to have one more. In this story, plump yellow Chickie, or rather his stuffed blue Bunny, is worried that Mother Hen is going out. After all, she has on her pretty necklace! Mother Hen reassures Bunny (and Chickie) and firmly guides them through various bedtime routines, as well as quite a few stalling techniques. Finally, Chickie is satisfied that everything is fine and tells Bunny "Let me sleep now!" Chickie's incessent worrying about Mother Hen's possible disappearance is a little nerve-wracking. I kept waiting for her to go out after all and Chickie to find a babysitter on one of his little excursions. But I did love the rich swashy colors of the painted illustrations. Verdict: Add this one for parents with a child suffering from separation anxiety. 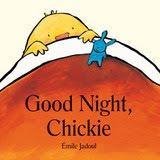 I would read it twice to children - once for them to identify with Chickie's worries and a second time so they can know that everything really is fine in the end.